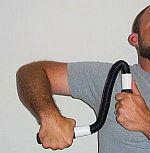 Specific HeartFlex exercises strengthen the hands, wrists, arms, shoulders, chest, and back. Simple and easy movements combined with multiple repetitions unleash the time proven benefits of swimming (without the water). Multiple repetitions build superior muscle strength and flexibility - while improving endurance and stamina. 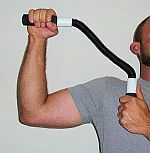 The HeartFlex baseball training aid targets and strengthens baseball specific muscles, their connectors, and joint structures. HeartFlex's "consistent resistance" assembly builds consistent muscle strength over the complete range of motion that is performed and is so unique it is protected by 3 US patents. 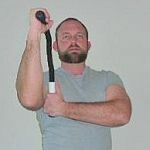 Other hand held products, using springs and bands, create "inconsistent progressive resistance" resulting in muscles that are not able to produce dependable power through their complete range of motion. Muscles have been compared to taffy. If you bend and stretch cold taffy it breaks and tears. Warm taffy bends and stretches without structural damage. Using the HeartFlex baseball training aid before practice and games warms up muscles and stretches them to their optimum length. Its simple and silent operation is ideal for dugout use - keeping muscles limber between innings and before batting. HeartFlex baseball training gear cools down players after rigorous training sessions and games. Players slowly decrease activity with HeartFlex eliminating accumulated muscle toxins while incrementally re-establishing pre-exercise physiology. The HeartFlex baseball training aid pits flexing muscles against extending muscles so each movement builds both sets of muscles at the same time - cutting workout time in half. 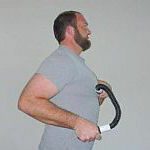 HeartFlex shoulder workouts exercise both shoulders in all three plains. 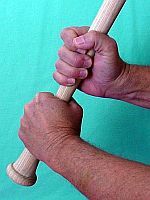 The gentle resistance is ideal for rehabbing injured shoulders and by simply adding repetitions baseball shoulder workouts can be made as rigorous as the player desires. 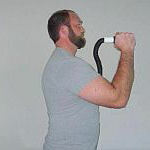 Heart Flex is lightweight (weighs about one half pound) and compact (only 24" long). 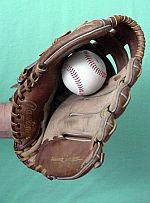 It is easily transportable for use at work, home, locker room, bus, dugout, or bullpen. HeartFlex is designed as a personal baseball training gear and its affordable price makes it possible for every team member to have their own. HeartFlex is designed for professional athletes. Because it uses the same principals of swimming exercise (easy "consistent resistance" combined with multiple repetitions) it also works for ALL ages and fitness levels. I've been using it (the HeartFlex) everyday and I really like it. I didn't see any huge body changes (like bigger biceps and chest) but I did definitely see changes in my grip strength. I also got more flexible. 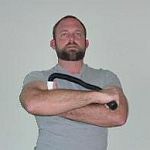 I know because the stretches with the HeartFlex that were hard for me are now much easier. I do it everyday as part of my warm-up and also at night. My forearm and wrist always feels really warmed up and ready before I play. I haven't felt any pain or soreness in my arm at all. Usually I feel a bit sore after pitching or long tossing. The soreness was always in the lower and inner elbow. I haven't felt that pain for a long time now. I could definitely tell you my pitching and hitting grip and flexibility improved. I feel that my arms got much stronger although its mass didn't increase much. HeartFlex performs "Active Range of Motion Therapy" (AROM) which allows its user to perform maximum joint manipulation through a complete range of motion (ROM). Heart Flex creates ONLY "consistent" passive resistance which lessens the chance of "overloading" and reinjuring healing muscles, their connectors, and joint structures. we met at the 2010 Conference in Dallas.